When you choose to stay in a Hawaii Beach Home, you’re close to all of the best things to do on Oahu! Oahu is a small island, however, so whether you stay on the North, South, or East Shore of the island, you’ll be within an hour of everything “The Gathering Place” has to offer. Here are our favorite things to do on the North Shore of Oahu! If you haven’t already, be sure to request access to our free Locals’ Guide to Oahu for a full list of the most popular and unusual things to do in the area! The Guide lists the best attractions to see, adventures to try, and places to eat on the North Shore. As local experts, we’re here to help you plan the perfect stay. Surrounded by coffee and pineapple fields, this rural part of the island is perfect for those who love surfing, swimming, snorkeling and hanging out with dolphins. When driving along the road, you’ll pass by horses grazing in lush green fields on one side of the car and beaches where surfers are carving the waves on the other. The North Shore is the world-famous surfing capital of the world. Recent movies like “Blue Crush” or the prime-time television program “Lost” which is filmed in the area, have further heightened the attraction to this area. 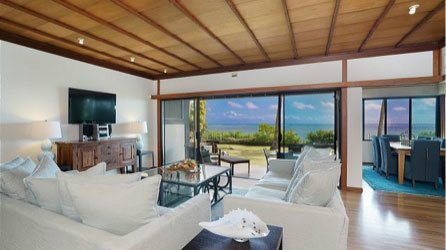 Our houses sit beachfront or on the edge of some of the most famous surf spots — Laniakea’s, Sunset Beach, Alligators and Waimea Bay. However, surfing is only one of the many things to do in North Shore Oahu. Here you can experience Hawaiian country life. There is Waimea Valley Falls Park, horse pastures, a growing local art scene and quaint historic Haleiwa Town. This all combines for a relaxing genuine Hawaiian vacation. Haleiwa Town is a quaint and tranquil town known for its rich surfing heritage. You won’t want to miss visiting this charming spot in the “country” of Oahu! There are no buildings taller than two stories here, and swimsuits are the attire of choice for strolling through town. You might even see a chicken walking down the sidewalk! Another part of what makes Haleiwa shine is the combination of vintage shave ice stands and Hawaiian art galleries! If you’re interested in a historic tour of the town, call (808) 637-4558. Learn about the town’s past, the pioneers who built it, and how it became the famous surf town that it is today. Stops include the Anahola Bridge, the Haleiwa Shingon Mission, Liliuokalani Church, and more! One of Oahu’s signature attractions is freshly made shave ice! Two of the best shave ice stands are Matsumoto’s and Aoki’s, both of which are located at the western end of Haleiwa Town. To the east of Haleiwa Town is a small airport. There, adventurous visitors and locals alike can go skydiving! Hawaii Skydiving is a great way to conquer a fear of heights or cross something special off your bucket list. Most travelers come to Oahu to relax. 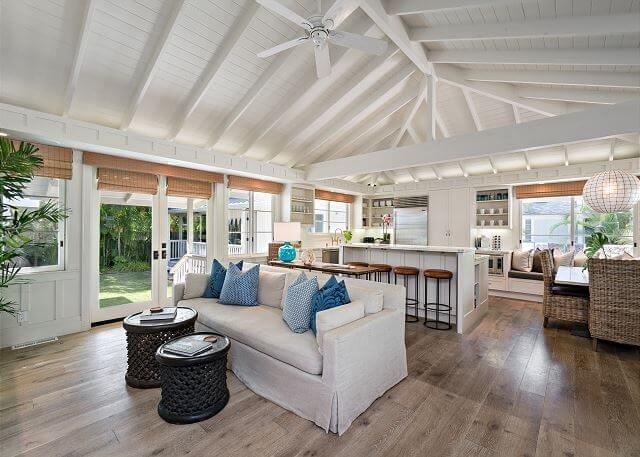 There’s no better place to unwind and escape the hustle and bustle of everyday life than a private beach home on the North Shore! Enjoy a tasty, open-air meal with family, or get a massage on the deck while listening to the sounds of the waves! Hands in Motion Massage has 18 years of experience performing private, in-home massages. 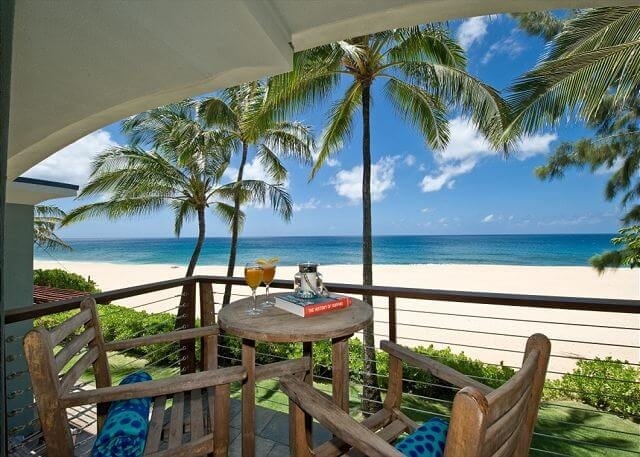 To arrange an appointment, call (808) 295-0683 and let them know you are a client of Hawaii Beach Homes. Whether you want to try paddleboarding, biking, hang gliding, or something else, the North Shore is packed with places to rent sports equipment. Surf N’ Sea is one of the most popular surf shops! They offer rentals for every type of traveler as well as ocean toys for families with children. If you want to enjoy these activities from the comfort of your beach home, contact our office after making your reservation and we can deliver equipment directly to your door! A trip to the North Shore isn’t complete without a trip to Dole Plantation! At this popular, family-friendly site, visitors can go on a pineapple train ride, explore a maze, and learn all about the planting and harvesting of the Hawaiian pineapple crop. Want to go for a swim in a waterfall, see an ancient archaeological site, or receive a private tour of a botanical garden? 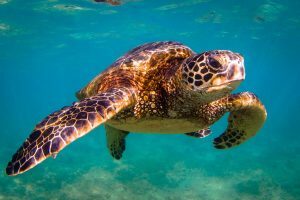 Hawaii Journeys Tours offers a variety of specialty eco-tours that you’re sure to love. Contact the Hawaii Beach Homes office to request information about additional tour options! We’d love to help you book a fun and exciting tour on Oahu. Hawaii’s most authentic luau and dinner show can be found at the 42-acre Polynesian Cultural Center. Here, you’ll experience South Pacific cultures as they have existed for thousands of years. Play the Derua drums of Fiji, participate in the Haka war dance of Aotearoa (New Zealand), and make fire from sticks and coconut husks like you would if you lived in a Samoan Village! The Honolulu Soaring Club takes people up for glider rides at the Dillingham Airfield in Mokuleia, which is about 15 minutes outside of Haleiwa. Seeing the North Shore beaches from a glider is a truly special treat! For those who are looking for a real thrill, you can go tandem skydiving right out of the same airfield through Skydive Hawaii. If you’re visiting on a Sunday, be sure to stop by the beach park in Mokuleia for a championship polo game! This is a fun way to unwind with family and experience an activity locals enjoy. Check the Hawaii Polo site for the schedule. Venture just past The Turtle Bay Hilton and you’ll find three-wheeled dune buggy rides, which are sure to thrill visitors of all ages! Children and adults alike will remember zooming over sand dunes surrounded by the North Shore’s natural beauty for years to come. This is the original filing sight of Jurassic Park. Here you will find all sorts of exciting nature-oriented outdoor activities such as cross-country bike tours, zip lining, ATV adventure packages and horseback riding. One of the best ways to immerse yourself in the culture of the North Shore is to learn how to surf! Whether you’re a beginner or just want to sharpen your surfing skills, this is an exciting activity for everyone! Hans Hedemann Surf School is a company we recommend with locations on both the North and South Shore. If you’re feeling particularly indulgent, treat yourself to a spa day at North Shore Nails in Haleiwa Town! This spa features a full menu of services and takes reservations on their website. Whether you desire a manicure, pedicure, or new set of colorful nails, you deserve a spa day when vacationing on Oahu! Lei Lei’s Bar and Grill is located next to the golf course at The Turtle Bay Hilton. It’s a wonderful place to hang out and enjoy the beautiful view! With locations on each shore of Oahu, Teddy’s Bigger Burgers offers handmade burgers in a quick-service environment. Located next to Hawaii Surf and Sail in Haleiwa Town, Kua ‘Aina Sandwiches and Burgers serves excellent mahi-mahi sandwiches and tasty burgers. Look for the street side tables with umbrellas. Waialua Bakery is a must for lunch! It’s a charming, local sandwich shop where the bread is freshly baked and the turkey is roasted daily. We love their smoothies, fresh cookies, and bright yellow building that can’t be missed. Waialua is also a local surfer hangout! Ready for an unforgettable trip to the North Shore? Don’t forget to request access to our complimentary Locals’ Guide to Oahu for a complete list of the absolute best things to do on the North Shore of Oahu. Then, check our availability and start planning!